Men are notoriously bad at choosing accessories and shoes are no exception. If you want to be sure your groom is wearing the appropriate footwear to your wedding check out this guide to mens’ wedding shoes. Men’s wedding shoes should generally be as narrow as possible with a slightly pointed toe to create the illusion of long slender legs. The most popular style of men’s wedding shoe is a slightly pointed loafer without laces. Round toed or boxy shoes are not a good choice for a formal outfit. The only time when they do work is if you are wearing a tuxedo, which is traditionally worn with a round toed shoe. Leather is the most common material for formal shoes, and it can be either matt or glossy. For very formal events, particularly in the evening, a velvet slipper can also work well. If the wedding suit is being hired, it may be worth asking if you can hire the matching shoes with it. Although some men are not keen on the idea of wearing hired shoes, it does increase the chances of finding a pair of shoes that match the suit, and it will save him splashing out on a new pair that he doesn’t have a suit to wear with. Just like the bride, the groom will be wearing his shoes for quite a good few hours on the wedding day. 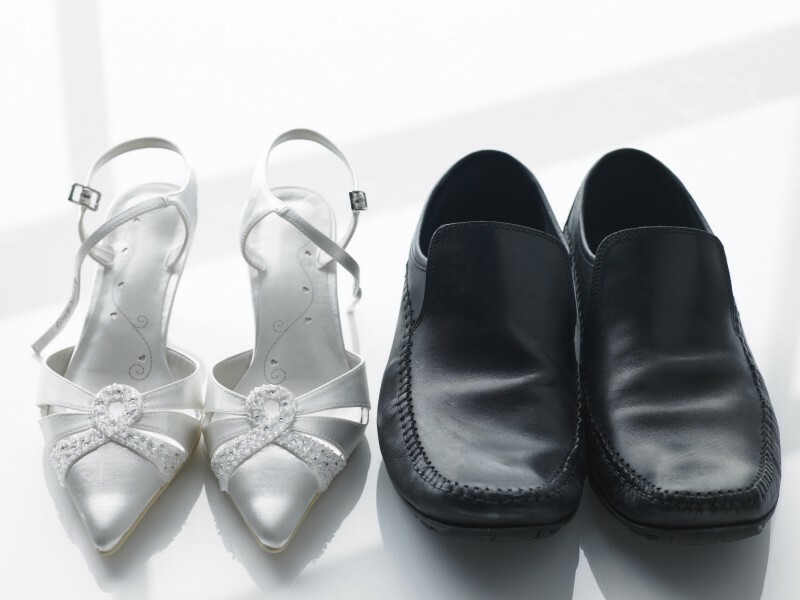 Wearing his wedding shoes to work for a week, or even just walking around the house in them in the month prior to the wedding will ensure he is comfortable enough to dance the night away without worrying about sore feet. It’s very rare to find a new pair that are comfortable straight away without being broken in. The colour of the shoe can be in contrast to the wedding suit, but should never detract attention from the outfit. If you do decide on laced shoes, you should make sure the laces are very thin, and that they exactly match the colour of the shoes. If the suit is light grey without any hints of brown, black shoes are the usual choice. White shoes can also be worn if it’s a daytime wedding. If the suit is white the best choice is to wear white shoes. If a coloured shirt is being worn with the white suit, shoes matching the exact colour of the shirt are acceptable. If the suit is black or charcoal only black shoes can look appropriate. They can be matt or glossy. If the suit is cream or tan, pale or medium brown shoes are the best bet. White shoes could be worn with a tan suit but wouldn’t look good with a cream suit. If the suit is brown, light grey or dark brown shoes are a good option, but if you’re not sure go for black.